It’s officially summer! I bet you too can’t wait to know where everyone is heading to for their vacation while flaunting their best summer #OOTDs, our fashionista babies included. And I’m so excited to be sharing more about a local brand that I’ve recently chanced upon on Instagram. Bibs Manila is an online shop that produces locally-made personalized bibs which uses materials such as poly and cotton for comfort and absorbency. Their non-personalized bibs, on the other hand, are all imported and are made of cotton. Having just recently opened in February 2019 to exclusively sell bibs, their undeniably cute and fancy designs were easily loved and patronized by parents, even godparents, grandparents and other friends of parents as a perfect gift for babies. Prices start at Php 120 each. What a steal! And to add to your excitement, we can all look forward to the “Design-My-Own Bib” which they will launch soon. In case you haven’t seen their newly-unveiled summer collection, check them out on their social media pages below. To get the first dibs on their promos, new and upcoming collections, you can also subscribe to their website’s newsletter. Our friends from Bibs Manila are so generous as they will be giving away (5) preset design personalized bibs of their choice to (5) lucky winners [1 for each winner]. 1. Like and follow Bibs Manila Facebook page and Bibs Manila Instagram. 2. Like and Follow Diana the Mama Facebook page and Diana the Mama Instagram page. 3. Subscribe to our websites: Bibs Manila and Diana the Mama. 4. Repost this photo on your IG account using the hashtag, #DianaTheMamaxBibsManila and tag at least 3 of your friends. Multiple entries are encouraged for more chances of winning, but make sure to follow all the steps in the mechanics for your entry to qualify. Giveaway closes on April 30, 2019. The winners will be drawn via random.org. Good luck! the cutes bibs! hope to win for my baby boy, thank mommy for this giveaway..
Super gaganda ng mga bibs. Stylish and very helpful . Need namin magina ito kasi nagngingipin na si baby so madalas na sya mag drool. Done with all the mechanics. Praying to win for my daughter. 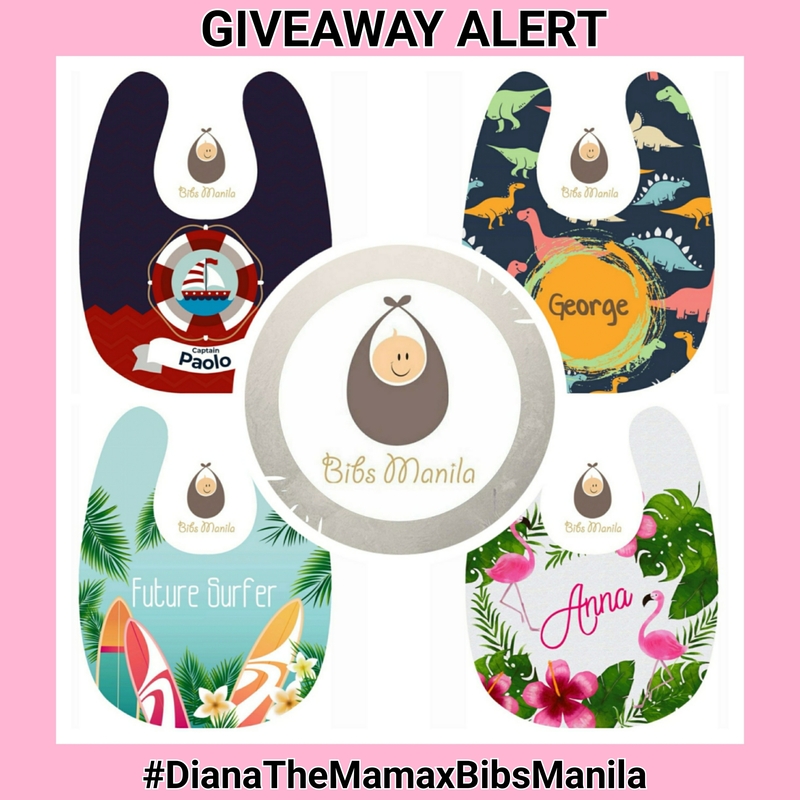 stylish and cute bibs from bibs manila, hope to win it for my grandchild.